Wearable action cameras will let you capture excitement-packed footage in a way that's simply impossible with a conventional standalone cam. Whether you're looking for incredible slow-mo shots or an awe-inspiring time-lapse, a decent action cam makes it all easy. Now, we're not saying you have to recreate something as jaw-dropping as Felix Baumgartner's space jump or backflipping over a canyon on your bike, but if a cycle around the park is about as extreme as you like to get, then you can at least make sure that you're set up properly to nab some footage. And once you've picked up a device, you're going to want to learn how to make the most of it. Well, luckily for you, we've rounded up some top tips for great action cam videos to help you along the way. 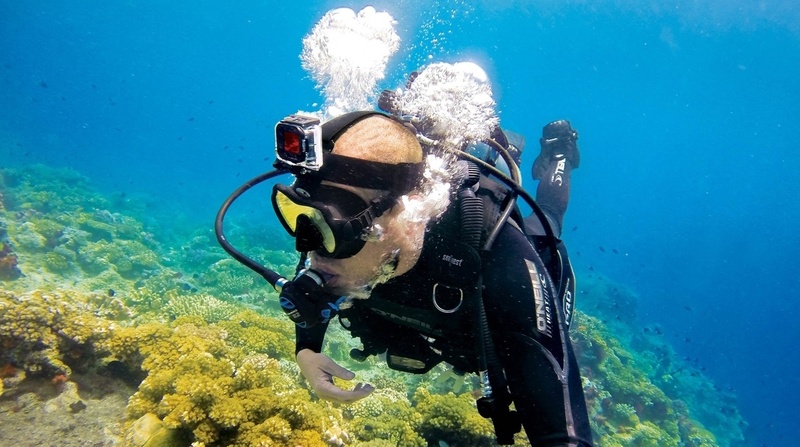 Action cameras tend to have very wide angle lenses to pack in as much activity and scenery as possible. When shooting at 1080p, the latest GoPro offers wide, medium or narrow fields of view - we reckon the narrow or medium options are best as the lens is so wide anyway, and the extra-wide setting tends to result in a 'barrel effect' with lots of distortion around the edges. You'll also need to think about the physical angle you want for your shot – POV (point of view) or anything that you wouldn't be able to see normally is best here. Speaking of which, check out the video above when country rocker Brad Paisley grabbed a GoPro from the crowd and played slide guitar with it. If you're setting up a shot where the camera will be static, use any natural light to your advantage, whether that's highlighting the object you're filming, or creating shadows and silhouettes. The good news about that wide angle lens is you can use it to get some really great fisheye still images. Even better news (perhaps) is that this is great for selfies as you can fit lots of background in behind your gurning visage. This is where a pole like the GoPole Grenade Grip comes in handy, letting you take a snap at arm's length. You don't want to get faces too close to the camera or you'll end up looking like a reflection on the back of a spoon. This rule does absolutely not apply to animals where the rule is, well, 'the closer, the better'. You simply can't lose with a close-up photo, or even a video, of a dog's inquisitive snout looming towards the camera. YouTube gold. We're not talking about twee Instagram filters, but actual filters that will improve your films rather than just making them look like they were made in the seventies. There are several options to choose from - in particular a red filter makes a big difference when you're filming underwater - just check out the video, which uses a PolarPro version at $29.99. If you're filming in very bright daylight, such as a snowy landscape, then a Neutral Density filter is the way to go. This slows down the shutter speed of the camera to ensure that footage is as smooth as possible without being overexposed. Most of the settings can usually be left on auto, letting the camera do the brainy stuff for you. However, if you want to tinker, GoPro cams will let you choose the white balance from 3000k for low light settings up to 6500k for places with lots of white light, like a brightly lit room or outside on a sunny day. You can also play with exposure and sharpness, if you're that way inclined. Depending on which camera you're using, it's likely that you'll have a choice of shooting resolutions ranging from WVGA (too low-quality for most) up to 4K (massive, but not really that usable because of the ropey frame rates). You're best opting for something in the middle - good ol' 16:9 1080p is the perfect middle ground. There's an incredible selection of mounts available for action cams, ranging from the GoPro Fetch for dogs to mic stand mounts and clamps for surfboards, heads and handlebars. And don't be afraid to go lo-fi with some gaffer tape – it'll keep things extra secure and help you adjust your shooting angle, if need be. Taping things securely can also help dampen vibration. Using a helmet mount will give you a great POV but you'll look like a plank – a chest harness is much more stable and will look ever so slightly less stupid. The surfing pig in the video above knows what's up, mount-wise. You might be able to get away with a solid three minutes of continuous film if you're skiing down a near-vertical mountainside at breakneck speed, but several minutes of you cycling along a mildly challenging woodland trail could prove incredibly dull. That's why the above video of road cycling champion Peter Sagan works well, using a mixture of settings, angles, close-ups, handheld shots, POV and conventional long shots to put the action into context. You can use basic (and free) editing software such as GoPro Studio to cobble your footage together and our main tip here would be keep it short. However short you think each clip should be, make it even shorter because people (even your most loyal friends) are easily bored. The best action camera ever made. Period. We're not suggesting tinkering with the space-time continuum, but what you can do is play with the time on your footage. You can use simple editing software to slow down video that you've shot at higher frame rates for an incredibly cool slo-mo result. For example, a video shot at 60fps can be played at half the speed by slowing it to 30fps. The latest GoPros also have a Time Lapse Mode where you can choose the interval at which the cam will take snaps - one a minute is the largest interval. Obviously you need to keep the camera completely still while filming a time lapse, so a tripod like the GorillaPod is probably in order here. The good news is that as all action cams are weatherproof (or have weatherproof housing), you can leave the camera set up outdoors all night if you wanted to capture a sunset or sunrise.